Just how good, exactly, are AX Armani Exchange Olimpia Milan and FC Barcelona Lassa? With more than half of the season elapsed and all the teams in the Turkish Airlines EuroLeague having played each other once, we can look at the fortunes and prospects of these two clubs – who will go head to head in the fashion capital on Wednesday night – and answer that question with a resounding…we don't know. We just can't say. What we can deduce is that both teams can be very good. At times this season, they have strung together long winning runs to look like genuine Final Four contenders. At other times, however, they have lost to all-comers, making you wonder whether their plummet down the standings would prove to be irreversible. Milan was the first to show its great potential, responding to a summer of exciting new recruits by setting off at a blistering pace with a 6-2 record. That run included an eye-opening 75-99 win at Olympiacos Piraeus and a couple of last-gasp victories which suggested team morale and collective durability were major assets, while the only losses were narrowly-contested and creditable battles against perennial title contenders Real Madrid and CSKA Moscow. But then came an almighty slump, with Coach Simone Pianigiani's team losing five consecutive games including home setbacks to FC Bayern Munich and Herbalife Gran Canaria, giving the team a losing record (6-7) and leaving the rest of the league to wonder whether the fast start had been nothing but a false dawn. Just when we were starting to write off Milan's season, however, the downward spiral was reversed by a key road triumph at Panathinaikos OPAP Athens followed by last week's thumping 111-94 win over Buducnost VOLI Podgorica, which set a new club record in scoring. So now we are still left to ponder...is this Milan team great, good or merely average? It has been a similar story for Barcelona, which also started the season by welcoming a series of high-profile new arrivals whose combination with a batch of talented returnees promised a great deal. 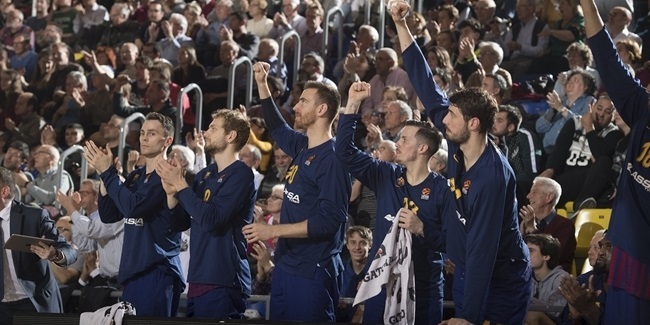 Barcelona started slowly, suffering an opening night 20-point pummelling at CSKA and then blowing a late lead to lose against EuroLeague newcomer Gran Canaria. It was starting to look like a third consecutive season of frustrating underachievement lay in wait. But a convincing Round 3 home victory over Bayern sparked a much-needed revival and, after Round 9's dominant victory over Milan, the Catalan club was sitting pretty at 6-3 with a sense of optimism renewed for the first time in a long time. You know what happened next, though: four consecutive losses to shatter that positive prognosis, especially as the team's offense completely disappeared by failing to score more than 65 points in any of those defeats. Just like Milan, however, the turn of the new year was accompanied by yet another change in fortunes, and Barcelona is heading into Wednesday night's game in Italy on the back of a three-game winning run and a 9-7 record, just one game short of the all-important top four. So what happens next? In truth, nobody knows, but it would be very easy to make a convincing argument for both or either of these teams going from strength to strength over the remaining weeks of the campaign because they are two rosters dripping with talent. In Milan, simple stats are enough to show the quality at Pianigiani's disposal: powerhouse big man Arturas Gudaitis is ranked third in the league in performance index rating (20.5 per game) and multi-faceted guard Mike James is placed fifth (18.6). And if possessing two of the top five players in the competition isn’t enough, Milan also has plenty more players with impressive numbers so far this season: Vladimir Micov averages 14.8 points per game, Nemanja Nedovic (although missing nine games through injury) has posted 13.6 points and 3.7 assists; Dairis Bertans is third in the league in three-point shooting conversion (54.9%); Jeff Brooks averages 5.5 rebounds; Andrea Cinciarini has made 68.8% of his two-point attempts, closely followed by Kaleb Tarczewski with 68%. When you put all those elements together, it creates a pretty awesome package, so it's no surprise to learn that Pianigiani's team is the second-highest scoring in the league, averaging 87.5 points per game. Barcelona's players don't boast such impressive individual stats, but it's only necessary to look at names like Thomas Heurtel, Kevin Pangos, Chris Singleton, Ante Tomic, and Adam Hanga – guided by the vast experience of coach Svetislav Pesic – to understand the quality of this group. In direct opposition to Milan, the greatest strength of Barcelona is defense. 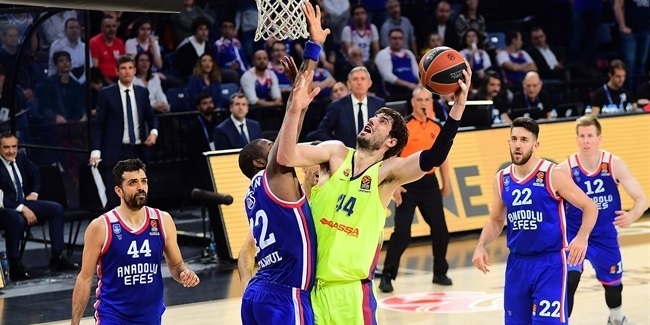 That has been particularly the case in the current three-game winning run, which started by restricting a dangerous KIROLBET Baskonia Vitoria-Gasteiz team playing in its own arena to 70 points and then did even better to hold Anadolu Efes Istanbul to 65 points – including just 15 in the entire second half. 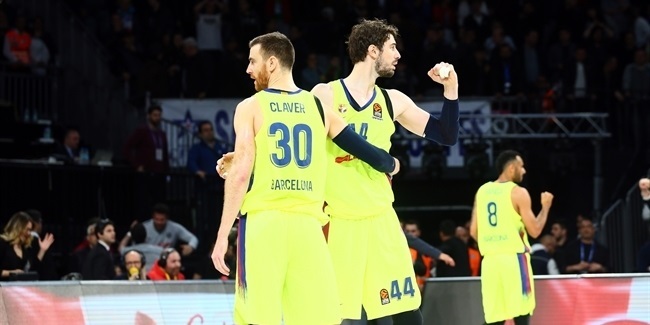 Overall, Barcelona has the second-best defense in the Turkish Airlines EuroLeague, having conceded just one point more than league-leading Fenerbahce Beko Istanbul (75.5 per game), and a lot of the credit for that achievement lies with unsung Spanish players Pierre Oriola, Pau Ribas and Victor Claver, whose hustle and defiant defensive attitude has played a major role in the recent turnaround. So there are no prizes for guessing where this week's meeting in Milan will be won and lost. If the home team can find its usual offensive fluency and reach towards its accustomed 90 points, it will be hard for Barcelona to keep pace; but the visitors will attempt to use their size – with Tomic, Singleton, Claver and Oriola joined by another big body in the form of Kevin Seraphin – and dogged defensive diligence to limit Milan to a much lower-scoring contest. Whether it is offense or defense that prevails in the end, the winning team will be in a strong position to continue its challenge for the top four, while the losers will be left to consider the danger of slipping out of the top eight altogether. And what's more, the game might give us a few more clues about whether these two teams are destined for greatness, mediocrity, or something in between.